An insipid India slumped to yet another series defeat with a pathetic display as arch-rivals Pakistan spanked the hosts by 85 runs in the second One-day International to take an unassailable 2-0 lead in the three-match series. Indian Captain M.S. Dhoni has said India will have to improve as a team after the hosts slumped to yet another series loss at home. The Anti-Corruption and Security Unit of the ICC had installed 145 close-circuit cameras in and around the Eden Garden stadium to keep a tight vigil during the India-Pakistan One-Day match. Normally the CCTVs don’t exceed 120, but this being a high-voltage match, ICC chose to instal 145 cameras for the first time. Euphoria reached its peak at the Eden Gardens today as fans went down memory lane when a number of former players from India and Pakistan were felicitated to mark the 25 years of Indo-Pak ODI matches. Australia’s four-pronged pace attack overcame spirited resistance from Lahiru Thirimanne and Mahela Jayawardene before dismissing Sri Lanka for 294 to bring an end to the opening day of the third Test on Thursday. Dean Brownlie hit an 69 off 89 balls and captain Brendon McCullum made 51 as New Zealand fought back in the third session of the second day of the first Test against South Africa. Senior batsman Sachin Tendulkar will boost the Mumbai batting line up in their Ranji Trophy quarter-final game against Baroda here from January 6 but the 39-time champions will miss pace spearhead Zaheer Khan due to his calf injury. Shaun Wright-Phillips’ second-half winner at his former club Chelsea handed Queens Park Rangers a surprise 1-0 win on Wednesday to give the bottom side a glimmer of hope in their battle to avoid relegation. Somdev Devvarman, who has suggested some sweeping changes in the organisation of Davis Cup ties in the country, was today routed in straight sets by world number six Tomas Berdych in the second round of the Chennai Open, here today. Two former winners on the Asian Tour, Gaurav Ghei and Rahil Gangjee, are among the 21 Indians who will feature in the Asian Tour Qualifying School, scheduled to be held from January 9 in Thailand. Victoria Azarenka goes into her Brisbane International semi-final against Serena Williams on Friday believing that selfishness is the key to ending four years of disappointment against her nemesis. Riding on Nasir Jamshed’s second consecutive century, the visitors posted 250 and then shot out India for 165. It was yet another woeful display by the Indian batting line-up, which has been largely responsible for the team’s forgettable results in recent times. The huge defeat will now raise questions on the future of some of India’s underperforming batting stars, who have let the team down more often than not. Jamshed (106) notched up his third ODI century, all three coming against India, but Pakistan suffered a dramatic collapse after being 141 for no loss at the mid-way stage. Mohammed Hafeez was the other contributor with a rollicking 76 off 74 balls. The floodgates opened up after the dismissal of Hafeez as none of the other batsmen could hang around for long on a slow Eden Garden track, which made stroke-making difficult with the older ball. The Indians needed a good start from struggling openers Gautam Gambhir and Virender Sehwag but it did not materialise yet again, putting pressure on the middle-order. Sehwag (31), Gambhir (11), Virat Kohli (6), Yuvraj Singh (9) and Suresh Raina (18) perished in quick succession to give the visitors the upper hand in what eventually turned out to be a lop-sided contest. Skipper Dhoni, who scored a heroic unbeaten 113 in the first ODI in Chennai, again provided some resistance with a cautious and unbeaten 54 but got no support at the other end. The series defeat against Pakistan marks another low for the team after the Test series debacle against England at home. The defeat also rendered the final ODI in Delhi on Sunday inconsequential. India lost the home ODI series against Pakistan 2-4 in 2004-05, and now have lost all the four matches they have played against Pakistan at Eden Gardens. Gambhir and Sehwag had a sedate start, though Sehwag scored a few boundaries. Just when the partnership looked like building, Gambhir chased a widish delivery from Junaid and was bowled. It was a familiar story from there on as the failing middle-order found the going tough against some disciplined fast bowling of Umar Gul and Junaid. India were reduced to 70 for four as Kohli continued and Yuvraj could not get to double digits, both dismissed caught behind. Even though Dhoni praised his bowlers for restricting Pakistan to 250, he came hard on India’s batting line-up. “Overall we have to improve as a team. We are a good fielding side, but we have to bowl well and develop,” he added. Pakistan skipper Misbah-ul-Haq praised Jamshed and Mohammad Hafeez (76) for putting up a match-winning 141-run opening stand, which was key to the visitor’s win today. “I think the team really played well, specially the way openers started, they gave us a really, really good start and then the bowlers did the job,” he said. Misbah also lauded his bowlers for dismissing India for a meagre 165. “I think the bowlers are really doing a great job, especially Junaid (Khan) who is moving it both ways and asking questions of the batsmen. (Mohammad) Irfan has his height and (Umar) Gul also bowled well today. (Saeed) Ajmal and (Mohammad) Hafeez always delivers for us,” the visiting captain said. Man of the Match Jamshed said playing at the historic Eden Gardens was always a dream for him. “I just enjoy my batting. The last time I missed the man-of-the-match but lucky this time they gave it to me. “I just kept a cool mind, and Hafeez played a great innings. Pitch was little bit slow, and I just played according to the ball. It was dream to play in the ground,” he said. “These includes eight each in the two dressing rooms and several others around the stadium including the press box,” a CAB official said. BJP and Shiv Sena have lashed out at the government for granting a visa to former Pakistan cricket captain Javed Miandad, asking how allowing a person related to underworld don Dawood Ibrahim to visit India will help improve bilateral ties. “This country loves the game of cricket but does not love terrorists. Dawood Ibrahim has been the mastermind of several terror acts. Pakistan has refused to hand him over to India despite several efforts. India should not allow any relative of Dawood to come to India,” BJP Vice-President Mukhtar Abbas Naqvi told reporters in New Delhi. Miandad’s son Junaid is married to Dawood’s daughter Mahrukh Ibrahim. Both Thirimanne, who scored a career best 91 just three days after joining the squad as an emergency replacement, and Jayawardene, who hit 72 in his penultimate innings as captain, threatened to make the day their own. Ultimately though, Australia captain Michael Clarke’s decision on winning the toss to send his pacemen out to bowl first was all but vindicated and the hosts will have finished the day confident they can wrap up the series 3-0. 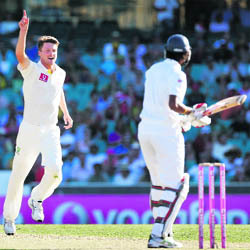 Jackson Bird, the least experienced of the pace quartet, took 4-41, Mitchell Starc 3-71 and Peter Siddle grabbed a brace with spinner Nathan Lyon pitching in to end Thirimanne’s knock just shy of his maiden Test century. Brought in for his first Test since last April to replace the injured Kumar Sangakkara, Thirimanne had shown a fight that had largely been absent from the batting of his better-known compatriots on the tour. The lefthander survived an lbw decision on his first ball courtesy of the television appeal and assumed the mantle from Jayawardene when his captain was dismissed after his first half century outside Sri Lanka for more than three years. Thirimanne reached his second Test half century with a cover drive off Mitchell Johnson for three runs and, punishing any loose deliveries, smashed 13 fours and a six in his 151-ball knock. The end to his innings came chasing another boundary off Lyon and it took an exceptional catch from David Warner at cover point to snare the miscued drive, leaving the batsmen bowed over his bat in despair. Injuries had forced Jayawardene into making four changes to the side that was thrashed by an innings and 201 runs in Melbourne last week and he seemed determined to make up for that humiliation, on his own if necessary. After a cautious start with his team on 26-1, the 35-year-old came out firing after lunch and smashed 13 boundaries in his 154-minute knock before Starc removed him with a fizzing ball that caught a thick edge and flew to Clarke in the slips. There was a nervous wait for the raucous crowd basking in the sun at the Sydney Cricket Ground while a check was made for the no ball, but the television pictures confirmed that Starc’s heel had grazed the white line. At stumps, the visitors were 169 for four in their second innings, still 133 runs behind. The Black Caps' second innings got off to the worst possible start when opener Martin Guptill clipped a leg-side delivery from Dale Steyn straight to mid-wicket in the first over. McCullum and Kane Williamson dug in to prevent the touring side from collapsing as they did when bowled out for 45 on the opening day. Williamson should have been out in the eighth over as umpire Ian Gould turned down a massive lbw appeal from Vernon Philander who took five wickets in the first innings. Captain Graeme Smith's failure to call for the review proved costly as replays showed that the decision would have been reversed. Two overs later Philander did call for a review for a caught behind, but replays were inconclusive and Williamson survived again. Williamson's gritty innings did end in the penultimate over before tea as Jacques Kallis had him caught at second slip for 15 with the score on 29. Earlier, South Africa, resuming after lunch on 335 for six, looked to increase the run rate and AB de Villiers struck a fine off-drive from Chris Martin to the fence. Tendulkar had recently retired from the One-day Internationals and is thus available for Mumbai’s remaining Ranji campaign, but Zaheer is out with a calf injury sustained during the team’s last league game against Gujarat. “Zaheer has sustained a calf injury and is currently in rehab in Bangalore,” said Mumbai Cricket Association’s joint secretary Nitin Dalal. Mumbai squad: Ajit Agarkar (Captain), Sachin Tendulkar, Wasim Jaffer, Suryakumar Yadav, Dhaval Kulkarni, Kaustubh Pawar, Abhishek Nayar, Hiken Shah, Aditya Tare, Ankit Chavan, Nikhil Patil (Jr.), Javed Khan, Shoaib Shaikh, Shardul Thakur and Vishal Dabholkar. Wright-Phillips smashed home a low strike after 78 minutes to deny Chelsea third spot and help the other west Londoners draw level with Reading at the bottom of the table on 13 points with only their second Premier League win. Chelsea, with a game in hand on leaders Manchester United and third-placed Tottenham Hotspur, have 38 points from 20 matches and trail the table-toppers by 14 points and Spurs by one. A Luis Suarez double for Liverpool helped the Uruguayan move one goal behind Premier League top scorer Robin van Persie in the scoring charts as Liverpool swept Sunderland aside 3-0 at home. Everton climbed above Arsenal into fifth place on 36 points from 21 games with a 2-1 comeback win at Newcastle United, who sit two points above the relegation places. Visitors QPR took advantage of a weaker Chelsea side, interim manager Rafael Benitez opting to rest Juan Mata and Eden Hazard, as they won their first away game of the season. Chelsea dominated possession and nearly broke the deadlock midway through the second half when Frank Lampard had a goal disallowed for being offside as he fired in a low shot. An off colour Somdev, a 2009 finalist here, was handed a crushing 3-6 1-6 defeat by his top seeded Czech rival in 65 minutes as he struggled to rein in his unforced errors. The quarterfinal line-up is complete as third Marin Cilic will take on fifth seed Benoit Paire of France in the top half of draw. From the bottom half, second seed Janko Tipsarvic of Serbia will take on Go Soeda of Japan and Stanislas Wawrinka will fight it out with unseeded Aljaz Bedene. Ghei is a three-time winner on the Asian tour and Gangjee won in 2004. They and 15 others will play the Final Stage while four Indians will figure in the First Stage, including Rashid Khan and Honey Baisoya. The world No. 1 from Belarus has a galling 1-11 win-loss record against Williams and is without a victory over the 31-year-old American since 2009. Azarenka is bidding to snap a nine-match losing streak against the woman widely perceived to be the best player in the world despite being officially rated third. In the doubles event, Sania Mirza and her American partner Bethanie Mattek-Sands reached the first final of the new season when their opponents — Daniela Hantuchova and Katarina Srebotnik — conceded their semifinal match.